Janne E. Nolan is a member of the international affairs faculty at George Washington University and a Senior Fellow at the Association for Diplomatic Studies. 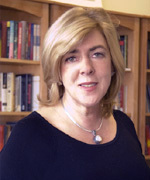 She has held numerous senior positions in the private sector, including as Professor of International Affairs and Deputy Director of the Ridgway Center at the University of Pittsburgh; project director and research faculty at the Georgetown School of Foreign Service; Director of Foreign Policy for The Century Foundation of New York, Senior Fellow in Foreign Policy Studies at the Brookings Institution, and Senior International Security Consultant at Science Applications International Corporation. Dr. Nolan’s public service includes positions as a technology trade and arms control specialist in the Department of State, as senior representative to the Senate Armed Services Committee, and as the defense advisor to several presidential campaigns and transition teams. She served as an appointed member the White House Presidential Advisory Board on U.S. Arms and Technology Policy (Chair), the National Defense Panel, the State Department’s Accountability Review Board (investigating terror attacks against U.S. embassies in East Africa), the Gates Panel to Assess the Ballistic Missile Threat to the U.S., and the Secretary of Defense’s Policy Board. Author of seven books, Dr. Nolan’s work includes: Guardians of the Arsenal: The Politics of Nuclear Strategy, Trappings of Power: Ballistic Missiles in the Third World, and An Elusive Consensus: Nuclear Weapons and American Security after the Cold War. She has received major research awards from the Carnegie Corporation of New York, the John T. and Catherine D. MacArthur Foundation (5 time recipient), the Ford Foundation, and the Ploughshares Foundation and serves on the board of the American Middle East Institute, the Arms Control Association, the Monterey Institute’s Non Proliferation Review, the Hewlett Foundation, and the Center for Climate and Security. Dr. Nolan is a member of the Council on Foreign Relations, the American Academy of Arts and Sciences Committee on International Security (second appointed term), the Aspen Strategy Group (Distinguished Emeritus), and the Cosmos Club.